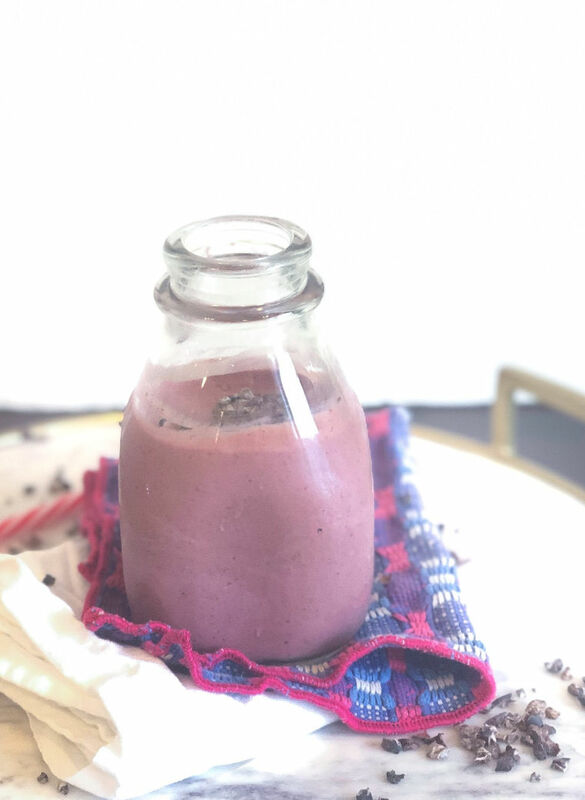 This Chocolate Cheesecake Cherry Smoothie is packed with protein~perfect for a healthy breakfast or post-workout snack! Made with only 5 ingredients and super easy to make~it’s a healthy delicious grab and go meal! I had forgotten just how much I LOVE this Chocolate Cheesecake Cherry Smoothie. And, just how easy it is to make. Not only is it delicious for breakfast (or lunch), it’s also a perfect post-workout snack, which I’ve taken to drinking after playing tennis with my girlfriends. Protein power! With 16 grams of protein per serving, it’ll help you met your daily protein goals. Not sure how much protein you should be getting each meal, or what foods are good sources of protein? 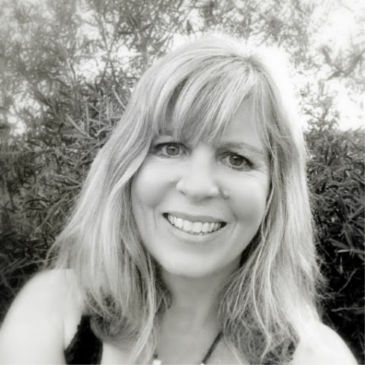 Check out my popular post: High Protein Breakfast Ideas for Vegans, Vegetarians, & Omnivores. Antioxidants! Cherries AND chocolate are good FOOD sources of antioxidants which may help promote healthy aging and overall good health. Fiber power! 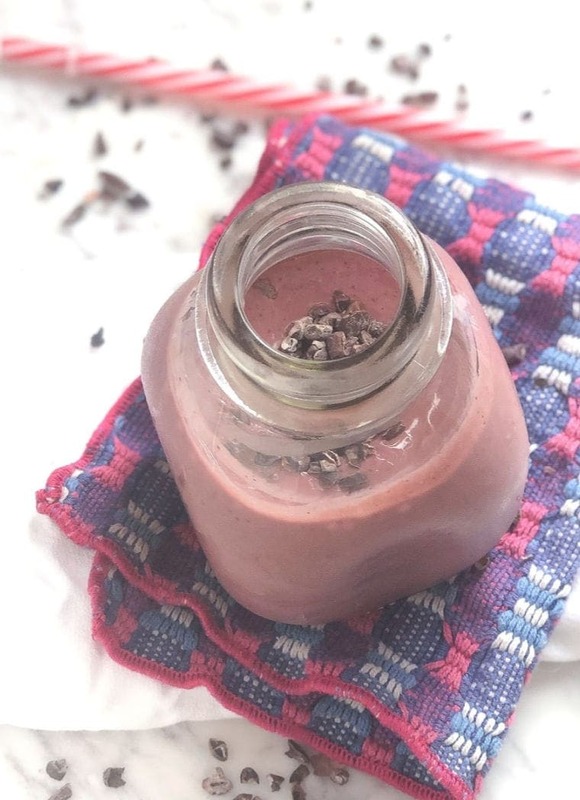 With 5 grams of microbiome friendly fiber, this chocolate cheesecake cherry smoothie will help you meet your daily fiber goal of 25-35+ grams per day. Balanced Macronutrients. This smoothie provides a nice balance of carbs, protein, and fat to keep your metabolism humming all morning (or afternoon!) long. Yum! Let’s face it, no matter how nourishing it is, you wouldn’t want to drink a smoothie if it didn’t taste good. Am I right? Give this a try and let me know if you love it a much as I do! How Do You Make a Cherry Smoothie? Once you gather your ingredients and a blender, it really is SO easy to make this Chocolate Cheesecake Cherry Smoothie. I’ve outlined the ingredients I used below, but feel free to get creative with whatever your favorites are, or what you have on hand. Easy, peasy!!! Cherries. Of course 🙂 If you’re making this in the summer, fresh, juicy cherries (de-stemmed and pitted) would be absolutely delicious, BUT frozen cherries, like I used in this version are super tasty to use year round. Protein. Cottage cheese works really well in this cherry smoothie, and adds a hefty boost of protein. You could also add tofu for a dairy free version, or any favorite protein powder. Lately I’ve been loving this (vegan, gluten free) almond protein powder from Noosh. It has 21 grams of protein per scoop, and no added sweeteners or flavorings for a clean, pure taste. Liquid. I like organic soy milk because it provides additional protein, but you can use dairy milk, or any non-dairy “milk” like my easy homemade almond milk, coconut milk, or whatever you have on hand. Flavorings. 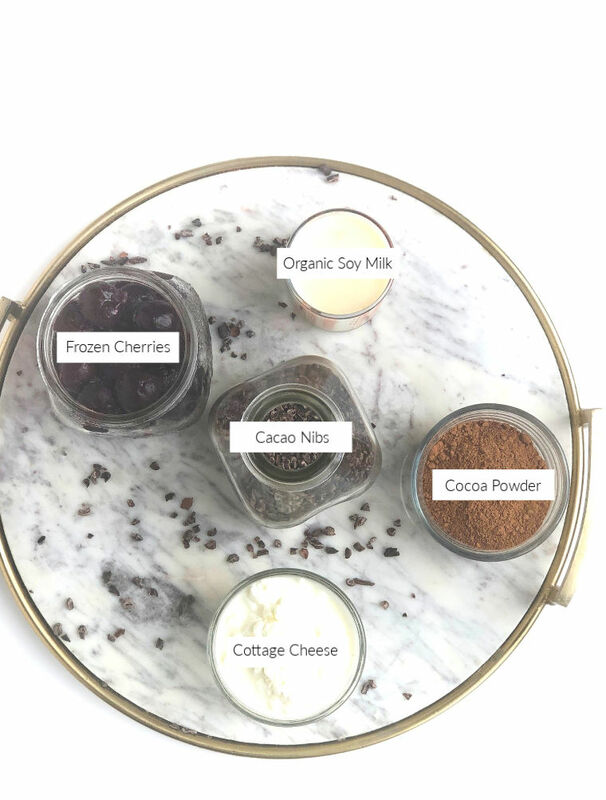 Because chocolate & cherries are a match made in heaven, adding a nice heaping tablespoon of cocoa powder really adds to the flavor of this cherry smoothie. But, you could also add pure vanilla extract. Spices, like cardamom or ginger, would be super tasty too. Smoothie Bling. I always like to add a little “bling” to my smoothies. In this case, cacao nibs add a nice crunch along with some extra antioxidants. You could also top with chopped pecans, almonds, shredded coconut, or hemp seeds. Yum! 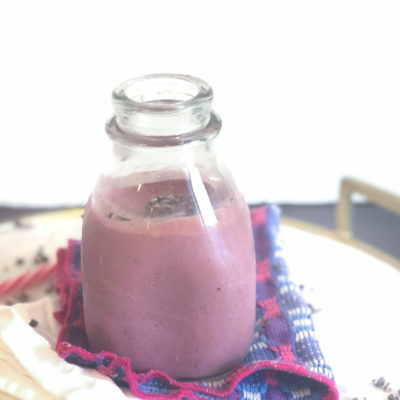 This Chocolate Cheesecake Cherry Smoothie is packed with protein~perfect for a healthy breakfast or post-workout snack! Made with only 5 ingredients and super easy to make~it's a healthy delicious grab and go meal! 1/4 cup organic soy milk or other "milk"
Place all ingredients, except cacao nibs, in a high speed blender, and blend until smooth. Pour into a glass and top with cacao nibs before serving. Cheers! In the summer you can use fresh, pitted and de-stemmed, cherries in place of frozen. Use tofu or your favorite protein powder in place of cottage cheese. Use any liquid (i.e. cow's milk, almond milk, coconut milk, oat milk, etc) in place of the soy milk. Not into chocolate? Flavor your smoothie with pure vanilla extract, or ground spices like ginger and cardamom. Swap out the cacao nibs with chopped nuts, hemp seeds, or shredded coconut. Craving more easy smoothie recipes? I’ve got you covered! These are just a few of my favorites. I think you’ll love them too! Cacao Date Smoothie. This smoothie isn’t as high in protein, but it’s SO delicious. Enjoy it when you’re craving something sweet, yet nourishing. Nutter Butter Butterscotch Pudding High Protein Smoothie. Another unusual combination, but also super delicious. Check out the recipe to see what secret ingredient I used. Pineapple Ginger Kale Smoothie. Perfect for when you want to get your daily leafy greens in, but don’t feel like munching away on a salad. Disclosure: This post contains affiliate links. I may make a small commission if you purchase any of these products, at no additional cost to you. I only share products I personally use or recommend. Your purchases help support the cost of running The Spicy RD blog. Thank you so much! Are you a fan of cherries and chocolate? What about cottage cheese? Do you play tennis? Are you any good??? Every tried using your mother’s chocolate cheesecake in the smoothie: just add liquid and cherries.